BELTON, Texas – Taking the lead for good with four minutes remaining in the first half, the LeTourneau University men’s basketball team held off the University of Mary Hardin-Baylor by a final score of 87-82 on the road at the Mayborn Campus Center in Belton, Texas on Saturday, December 1. LETU improves to 4-4 overall and 1-1 in the American Southwest Conference while handing the Crusaders their first loss of the season. UMHB is now 6-1 overall, and 1-1 in the ASC as only three of 13 ASC schools (Louisiana College, Howard Payne, and Ozarks) made it through the opening weekend of ASC play without suffering a defeat in conference games. Back-and-forth action would set the tone for the game early on as two ties and three lead changes occurred in the opening 3:49 of work. UMHB would use a free-throw, and fast break jump shot to break a 9-9 deadlock and go up three but see LETU junior Nate West tie the game again on his second triple of the night as the YellowJackets would have an answer for every run made by the Cru. With Mary Hardin-Baylor holding an 18-12 lead with 12:55 remaining, both teams would go through a bit of a scoring slump as the pace would slow down until a Caleb Loggins layup tied the game at 21-21 seven minutes later. Justin Moore would give LETU their first lead since the 5-4 mark as part of a 6-0 run that would put LeTourneau up 29-25 but see UMHB get a layup and foul cut the lead down to one with 2:51 remaining in the opening period. Using an 11-4 run, LETU would appear to grab momentum heading into halftime up eight, but a three-pointer for Sam Moore at the buzzer allowed the Cru to trail 40-35 at the break. Both teams would match each other point-for-point in the opening four minutes of the second half as LETU would manage to maintain their five-point lead despite Loggins picking up his fourth foul just one minute into the second half. Despite repeated efforts from UMHB, LeTourneau continued to hold their two-possession lead before matching their most significant point of the first half as Elijah Gerber would nail a fast break try to put the YellowJackets up 54-46. LETU would then push their lead to nine with 11:03 remaining in the game but see Mary Hardin-Baylor close the gap to three with four quick points in 19 seconds behind the approval of the home crowd. 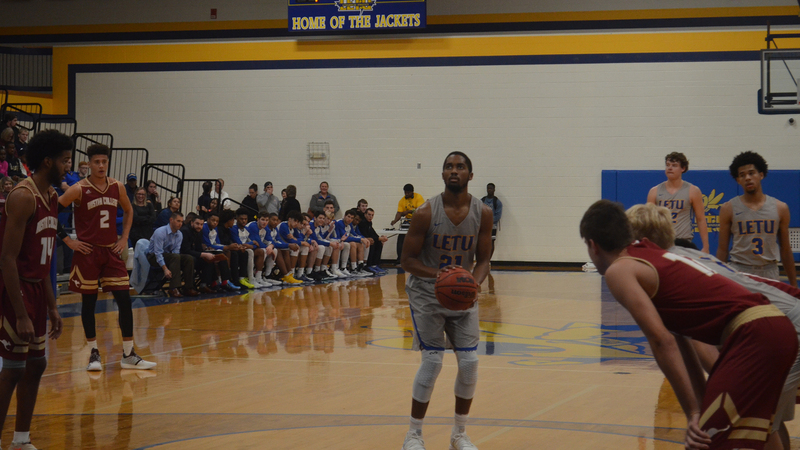 LETU would stick to their game plan as had worked throughout the game as the YellowJackets took their largest lead of the night at 74-64 with 5:57 remaining while threatening to put the game away in crunch time. Using the bonus and double-bonus to their advantage, UMHB would make one final push to cut into the LeTourneau lead as a pair of Demarius Cross free throws put the score at 80-78 with 1:35 remaining and made the next LETU possession crucial for the YellowJackets. Needing a bucket not to risk giving the Cru a chance at tying the game or taking the lead, senior Seth Mattson would step up at the moment as he would drain a three with less than five seconds remaining on the shot clock to put LeTourneau up 83-78 with 1:08 remaining. The final 68 seconds would wind up becoming a free-throw shooting contest as UMHB would be unable to close the gap any closer than three due to West and Moore coming through in the clutch at the charity stripe to give LETU a five-point victory. As they have done throughout the season, LETU would use the three-point shooting to help come away with the victory after outscoring UMHB 24-12 from beyond the arc. The game would also see a battle in the paint as the YellowJackets held a 46-44 advantage in points in the paint to overcome a 28-16 deficit in fast break points. Leading the charge of four players in double-figures, West would score a game-high 28 points and nearly miss out on his second triple-double of his career after finishing with eight rebounds and nine assists. Seven of the nine assists would come in the second half while the junior would finish 12-for-14 at the free throw line. One more weekend of pre-Christmas games remain for LeTourneau, beginning Thursday, December 6 at 7:30 p.m. when the YellowJackets host Sul Ross State. LETU’s next five regular-season games come inside of Solheim Arena, where the YellowJackets are 25-4 overall since the start of the 2016-17 season. 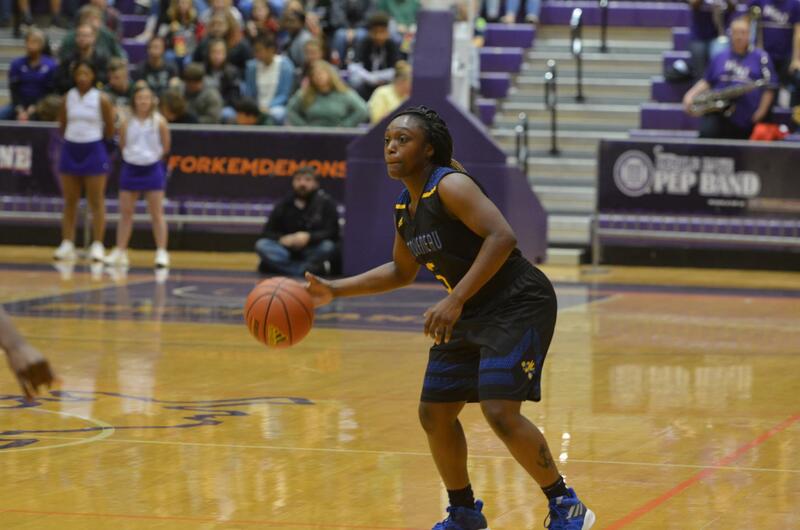 BELTON, Texas – Closing out a season-opening six game road trip, the LeTourneau University women’s basketball team fell to number-25 nationally-ranked University of Mary Hardin-Baylor by a final score of 80-48 at the Mayborn Campus Center in Belton, Texas on Saturday, December 1. The loss drops the YellowJackets to 1-5 overall and 0-2 in American Southwest Conference action while the Crusaders move to 7-0 overall and 2-0 in ASC play. 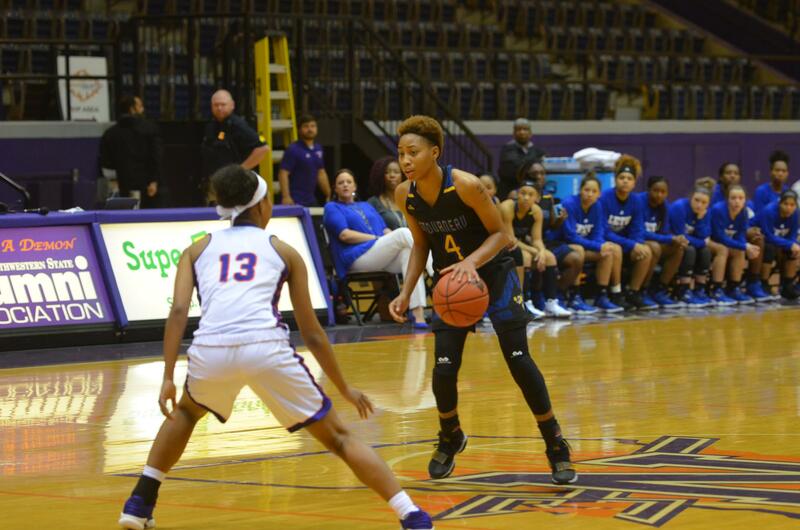 LETU and UMHB would trade buckets in the opening minutes as Keauna Whitfield was quick to answer the Cru with a layup and a three-pointer to make the score 8-5 in favor of Mary Hardin-Baylor. LeTourneau would manage to keep within two possessions through the opening five minutes of play before seeing an 11-0 UMHB run open a 25-9 lead as the YellowJackets would suffer through a 4:35 scoring drought. Three-point shooting would help keep LETU on the fringe of cutting the Cru lead down to single-digits for much of the second quarter, but Mary Hardin-Baylor would continue with a hot-shooting touch as LeTourneau could not close the gap in the first-half any closer than 13 before seeing UMHB score five of the final seven points to lead 45-26 at intermission. In the second half, LETU would do their best to try and keep the pace with UMHB to cut into their deficit but see a stout Cru defense hold off the YellowJacket offense. Mary Hardin-Baylor would manage to outscore LeTourneau 19-12 in the third quarter to stake themselves a 64-38 lead which would continue to grow throughout the fourth quarter. After shooting 41 percent (11-of-27) in the first half, LETU would be held to just a 7-for-34 output (20.6 percent) in the second half as the YellowJackets saw UMHB finish 50 percent from the field on 26-of-62 shooting. The Cru built their lead on points off turnovers (20-9) and a 14-5 advantage in second-chance points to overcome as LeTourneau would be guilty of 25 turnovers. A 10-point performance from Whitfield would lead LETU while Sha’Donnaver Young pulled in seven rebounds and recorded three assists. LeTourneau returns to action in their home opener against Sul Ross State University on Thursday, December 6 at 5:30 p.m. The Lobos enter Thursday’s matchup with a 2-4 overall record and are coming off a 70-47 non-conference loss to the University of the Southwest. LONGVIEW, Texas – The LeTourneau University athletic department hosted its annual Fall Sports Banquet on Tuesday, November 27. 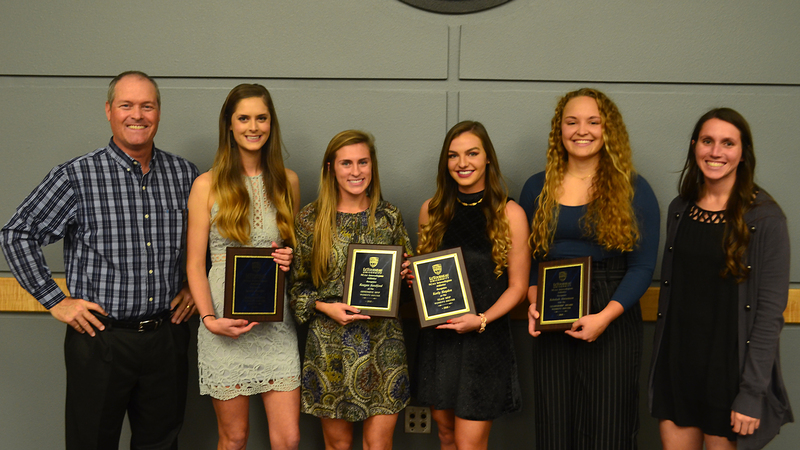 Five fall sports (men’s and women’s cross country, men’s and women’s soccer, and volleyball) presented their team awards to recognize achievements, both on and off the field, court, and course. Each sport gave out end-of-season awards based on their competition with each recipient of an award being presented with a plaque to commemorate the occasion. The individual sports awards are below. Photos of last night’s event is here. 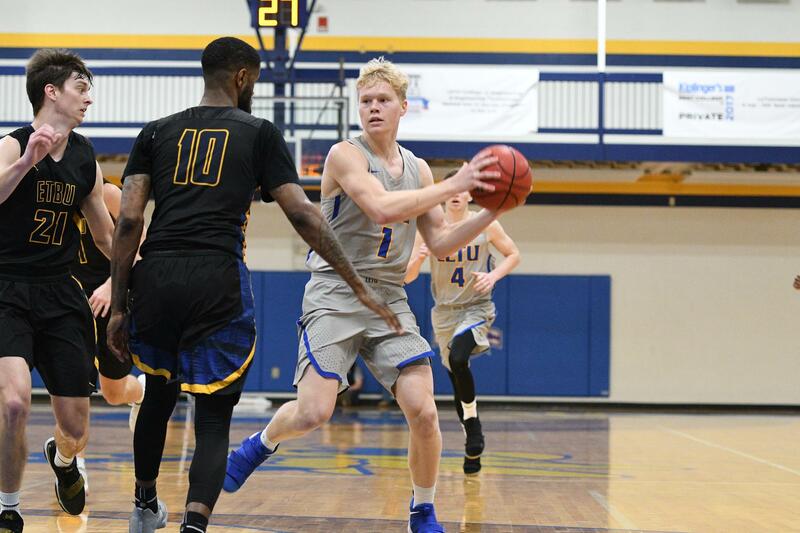 AUSTIN, Texas – Trailing by five points at halftime, the LeTourneau University men’s basketball team could not manage to reclaim a second-half lead in an 87-82 road loss at Concordia University Texas at the Concordia Fieldhouse in Austin, Texas on Thursday, November 29. LETU falls to 3-4 on the year and 0-1 in the American Southwest Conference after losing to the Tornadoes for the first time since January 5, 2015, while CTX improves to 2-4 overall and 1-0 in the ASC. Concordia wasted no time jumping all over the YellowJackets, scoring 10 of the first 11 points heading into the first media timeout of the game to stun an LETU team that typically gets off to fast starts of their own. Senior Caleb Loggins would pull LeTourneau within six at 13-7 with 14:39 left in the first half by using a 6-2 run but could not close the gap any more in the opening 10 minutes of the game. A layup and foul from C.J. Bird cut the Concordia lead to three 23-20 as the YellowJackets would start to see momentum swing in their favor before Joe Neal of CTX capped off a 9-2 run with a triple to put the Tornadoes up 32-22 with 7:57 left in the first half. LETU would make one last push in the first half and cut the deficit back down to four at 37-33 following a Nate West triple, eventually cutting the lead down to three before trailing by five at the break. Justin Moore got LeTourneau going offensively to start the second half, hitting an open three to cut the lead down to as little as two at 48-46. Concordia would continue their relentless offensive attack to maintain their two or three possession lead but could not manage to build their lead any larger early in the second period. Things would start to get away from the YellowJackets as CTX took their largest lead of the game at 73-60 with 7:09 remaining before LETU would clamp down on defense and manage to go on a 10-0 run with West scoring the first eight points of the rally. Loggins would cut the Concordia lead down to a single-point at 74-73 on a three-point play before seeing the Tornadoes respond with seven-straight points to go back up eight with 3:15 remaining. One final rally by the YellowJackets would see LETU close within four at 86-82 on a Moore layup in the last minute of the game before seeing CTX score the lone remaining point of the contest to hold on for a five-point victory. West led all scorers with 27 points and added six rebounds while Loggins recorded his second double-double of the season with 21 points and ten rebounds. Seidl nearly missed out on a double-double after finishing with nine points and a team-high 13 rebounds as the YellowJackets held a 49-42 rebounding advantage over Concordia. All five starters would carry CTX in double-figures as the Tornadoes scored only 12 points from bench players. LeTourneau will look to salvage opening weekend of ASC play with a 7:30 p.m. game at Mary Hardin-Baylor on Saturday, December 1. The Cru picked up a 95-85 home victory over East Texas Baptist on Thursday night to stay undefeated at 6-0. AUSTIN, Texas – Battling back and forth battle for much of the first half, The LeTourneau University women’s basketball team was unable to outlast the Concordia Texas Tornados in their first American Southwest Conference matchup of the season on Thursday, November 29. The loss drops the YellowJackets to 1-4 overall and 0-1 in ASC play. The Tornados moved to 2-5 overall with the victory and 1-0 in ASC action. Looking to set the tempo early for the LETU offense, a jumper from Sha’Donnaver Young put the YellowJackets on the board first and sparked an early 8-2 run. CTX would fight back from the early deficit, taking a 21-11 lead with 1:36 left in the first quarter before LETU managed to keep their offensive game intact as they were able to tie it back up at 17. A slow offensive start to the second quarter by both teams gave the defenses an opportunity to prove themselves as they recorded a total of four forced turnovers in the first five minutes, but baskets by Madison Mayfield and Faith Hudson kept the LeTourneau within reach. A pair of three-pointers coming from the Tornados within the final four minutes led to Concordia’s biggest lead of the night at 37-28, as LETU would trail at intermission by a score of 39-30. The YellowJackets, tasked with a comeback once again, saw their points come in spurts throughout the third quarter but would be unable to close the gap as CTX maintained their nine-point lead heading to the fourth. A quick jumper from Alexandria Thorne to start the final ten minutes of play put the Yellowjackets within seven, but Concordia was ready to answer scoring six straight points of their own to push their lead back to double-figures. While LETU’s offense never gave up neither did the Tornados as a 23-point fourth quarter held off LETU from completing a comeback. Young scored a team-high 14 points while two other YellowJackets scored double-digit with Alexandria Thorne (12) and Keauna Whitfield (10) helping to pace the offense. Along with Whitfield’s ten points, the sophomore would grab ten rebounds to walk away with a double-double. The YellowJackets saw a significant advantage in rebounds with a 43-29 lead on the glass as 18 rebounds coming on the offensive end. Concordia held the upper hand in shooting percentage as they shot 39.6 percent from the field and held the YellowJackets to 35.1 percent from the floor. LeTourneau closes out a season-opening six-game road trip when they travel to Mary Hardin-Baylor on Saturday, December 1. The Crusaders are 6-0 after knocking off previously undefeated, and number-nine ranked East Texas Baptist 87-74 in their ASC opener. 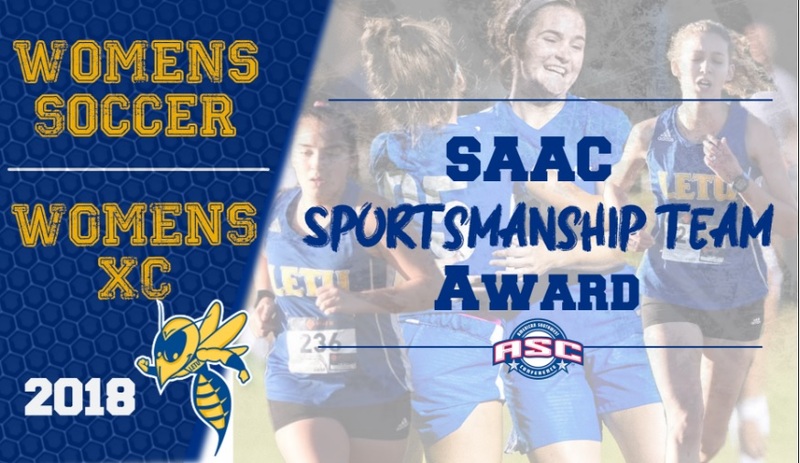 RICHARDSON, Texas – LeTourneau University was one of five American Southwest Conference member institutions who was recognized by the conference Student-Athlete Advisory Committee (SAAC) as the YellowJacket women’s soccer and women’s cross country teams were named the recipients of the SAAC Team Sportsmanship Awards for the fall of 2018. The SAAC Team Sportsmanship award honors the member institution in each ASC championship sport that best displays positive qualities of sportsmanship and fair play from its student-athletes, coaches, and fans throughout the season. Men’s and women’s cross country, football, men’s and women’s soccer, and volleyball with each of the 13 campus SAACs voting within the sports it sponsors receive the fall 2018 awards. LeTourneau women’s soccer earned the award for the third time after winning the award in 2013 and 2016 while the YellowJacket women’s cross country team was named co-recipient for the second time in school history (2012, 2018). LETU was one of only two schools to have multiple teams earn the SAAC Team Sportsmanship Award in the fall, with East Texas Baptist leading all schools with four teams garnering recognition. It is the twelveth year presenting the ASC SAAC Team Sportsmanship award during the 2018-19 sports seasons. The announcement of the winter award recipients will occur following completion of the men’s and women’s basketball championships.